Kandy is Sri Lanka’s second largest city and home to a Sinhalese cultural tradition of which Sri Lankans are justifiably proud. 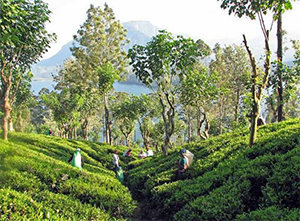 It lies at the very heart of Sri Lanka, surrounded by lush green hills. The unique cultural heritage can be seen and felt everywhere in the architecture, music and dance of this extensive city, which has a pleasantly cool climate because of its elevation. 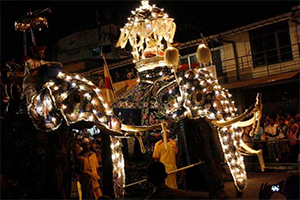 Its undoubted centrepiece is Sri Lanka’s most important religious shrine, the Temple of the Tooth and its most exciting event, a parade involving over thirty fantastically costumed elephants, is the festival ‘Esala Perahera’. 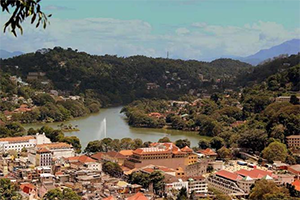 Kandy has a wonderful combination of historical significance and natural beauty, leading to its being named an UNESCO world heritage site in 1988, like Galle, but for very different reasons. 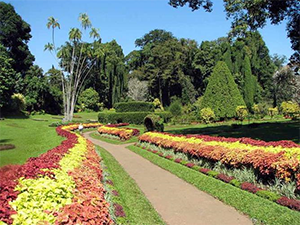 The lovely countryside around Kandy contains a great variety of attractions, among them the beautiful Peradeniya Botanical Gardens. 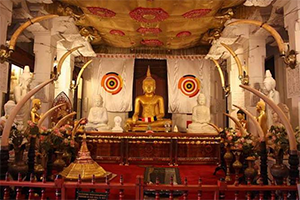 The region’s cultural heritage can be seen in the various historic temples set at intervals throughout the area, dating from the heyday of the Kandyan kingdom. You can see the compelling traditional Kandyan dancing at one of the city’s several cultural performance venues. To get away from it all, visit the rugged Knuckles Range, just to the east. This is Sri Lanka’s hill country, the last great wilderness area and a great place for trekking and bird watching.